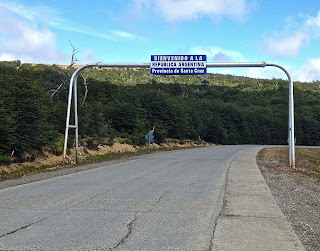 Once again, yesterday, I crossed the border from Chile into Argentina and, again, there were no glitches as I passed through Chilean immigration and customs at the Dorotea border post, a short distance from Puerto Natales. 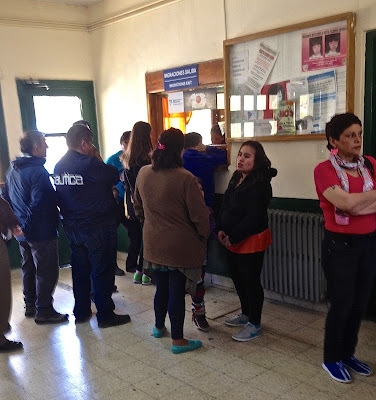 The Chilean side was brightly lighted, orderly and efficient, with short lines and quick service – certainly none of the hassle that I experienced in crossing over to Mendoza last month. On the Argentine side, things were not quite so efficient, to say the least. The Argentine border post (pictured below) is larger but dingy and, though there were two immigration officials at a tiny window, the line – such as it was – never seemed to move. When I finally reached the front, I reminded the young woman there that the receipt for my so-called “reciprocity fee” was in my previous passport, which I also provided her, but that appears to continue to confuse Argentine immigration everywhere except for the international airport at Ezeiza, where I originally paid it. Perhaps that’s because it’s no longer possible to pay on the spot as I did in March of 2010, eight months before that passport expired. The fee is valid for ten years from the time of payment, but at present it’s only possible to pay online, and arriving Australian, Canadian and US visitors must show a printout of their payment. I might guess that this young woman is a newer employee who might never have seen a receipt like mine (pictured above), but that didn’t explain the half-hour or more that it took for her to examine every page in my passports – including two trips for apparent back-room consultations and a request to wait alongside the window while she attended another customer – but I eventually got the stamp that admitted me to Argentina. This should be the last time until I fly from California to Buenos Aires in mid-April. After that, and refilling the tank at the coal town of Río Turbio - where gasoline is cheaper than in southernmost Chile - I made my way to El Calafate, where the weather has turned summery. 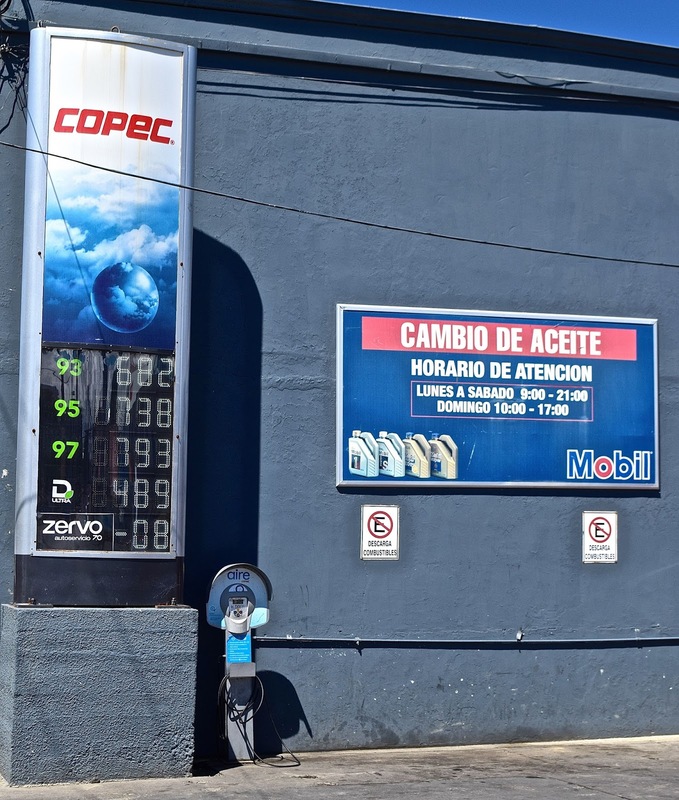 Meanwhile, I’ve written an op-ed on why Argentina’s government should eliminate the “reciprocity fee” – urgently and unilaterally – that’s due to published in the Buenos Aires Herald. Whenever that happens, I’ll post links here, and on my Facebook and Twitter accounts. Across from Puerto Natales, on Seno Última Esperanza (“Last Hope Sound”), some of the mountainsides are still showing snow in early summer, but it’s been raining most of the day and the grass here is green – reminding me, on the most tedious day of the year, of Stan Freberg’s classic comedy spot "Green Chri$tma$." 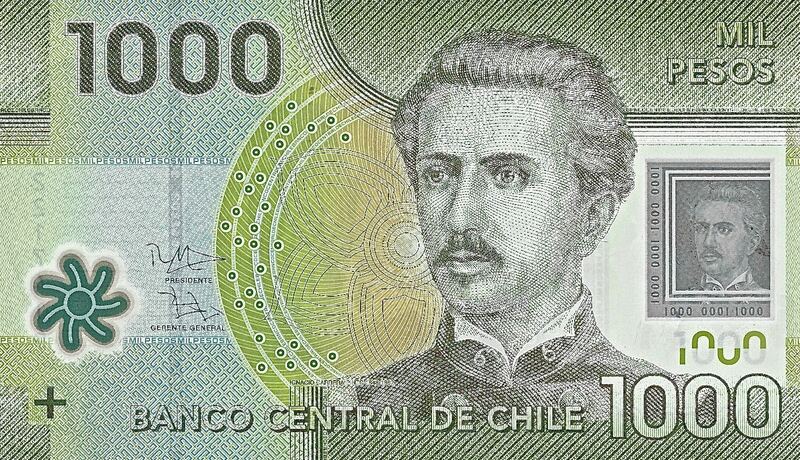 Recently everyone’s been talking about money in Argentina – most notably the end of the “currency clamp” – so let’s talk about Chile instead. 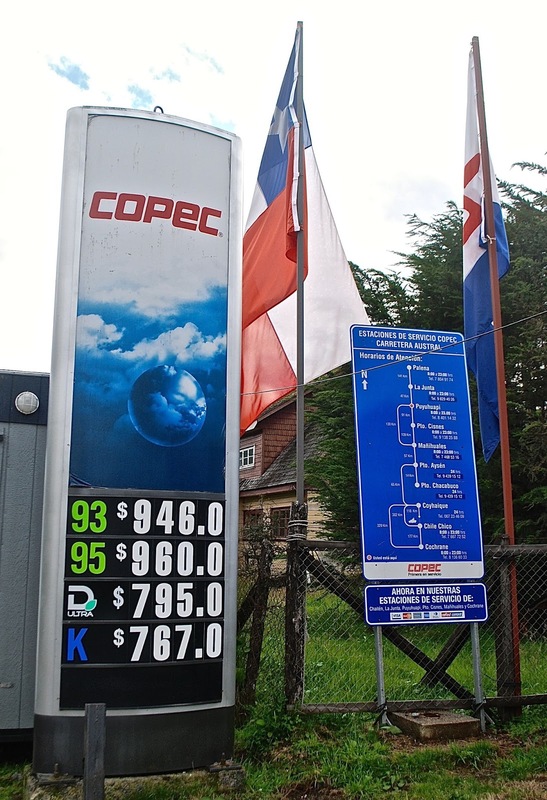 When I arrived in Natales late last February, the Chilean peso was at 618 per US dollar; a year earlier it had been at 558 per dollar. Today, though, with demand for Chilean copper slowing, the dollar is now worth nearly 700 pesos and prices are falling accordingly. 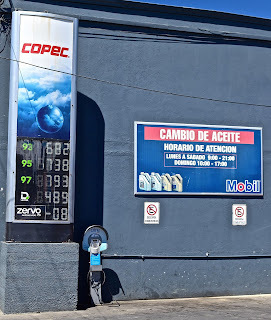 One obvious item is that, in a country with some of the continent’s most expensive gasoline – in past years, I’ve paid well over US$6 per gallon (US$1.58 per liter) in some locations – it’s now as low as US$3.70 per gallon (US$0.98 per liter). Contrast the photo above, from Puerto Puyuhuapi in February of 2014, with the one below, taken a few days ago in Punta Arenas. With low inflation, and no need to change surreptitiously as has been the case in Argentina, Chile is definitely more affordable at present. One thing has changed for the worse, though. 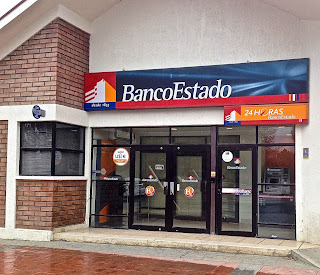 In the past, I’ve always recommended using the ATMs at BancoEstado, the state-run bank that had not imposed a charge on foreign currency transactions. When I arrived in Santiago last month, though, I was surprised to learn that their ATMs would now collect a 4000-peso (US$5.72 at present) fee for each withdrawal. That’s still lower than other Chilean banks, which charge up to 6000 pesos (US$8.58) per withdrawal. 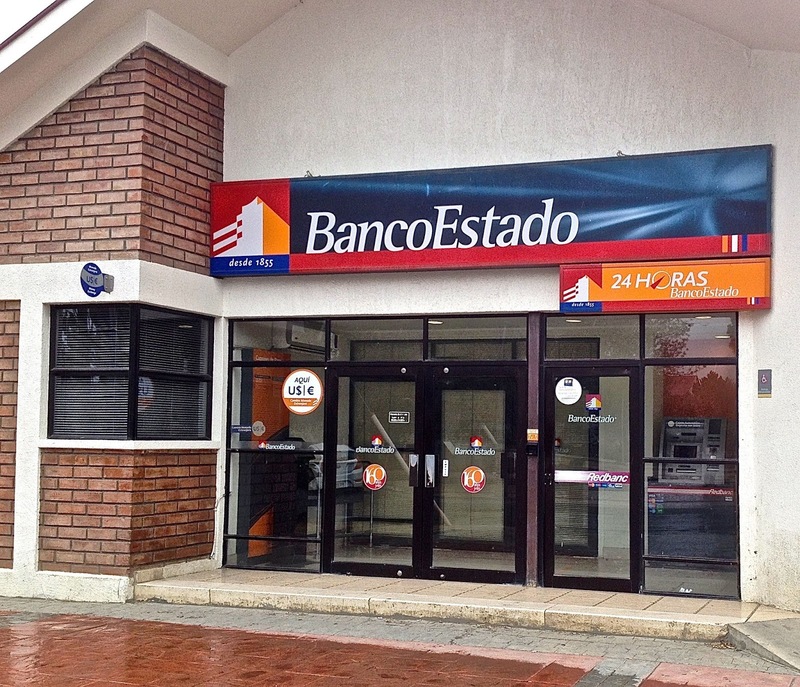 In cases like this, it pays to withdraw relatively large amounts, so today I withdrew 200,000 pesos (US$285.95) at a branch here – that’s generally the largest allowed per transaction. Withdrawing smaller amounts with greater frequency is, obviously, far more costly. That said, I did note what I hope may be a pleasant surprise. Chilean ATMs ask your approval before collecting the fee, giving you the option to cancel the transaction. Today’s did not, though, so perhaps they never reprogrammed the machines here and I got off cheap. I can only hope. For visitors to Patagonia, whisky (whiskey, if you prefer) is probably not the first thing that comes to mind, but in southernmost Chile it’s become something of a tradition on excursions and cruises. 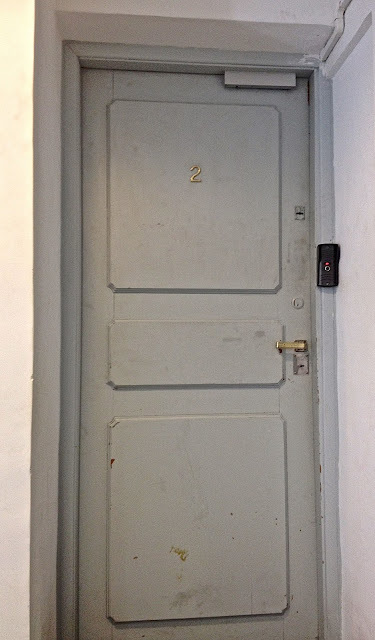 I’m not much of a whisky drinker – my entire lifetime consumption probably amounts to less than a fifth – but I always look forward to it here. Recently, it’s happened twice. 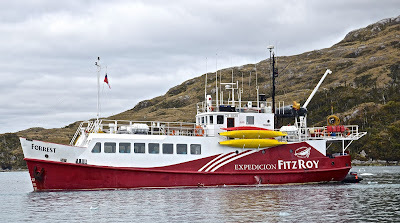 Just a few days ago I took a two-night, one-day whale-watching trip to the western Strait of Magellan on the M/V Forrest (pictured above), which formerly hauled wool and supplies around the Falkland Islands before being reconditioned as a compact cruise vessel – bunks rather than beds - in Chile. 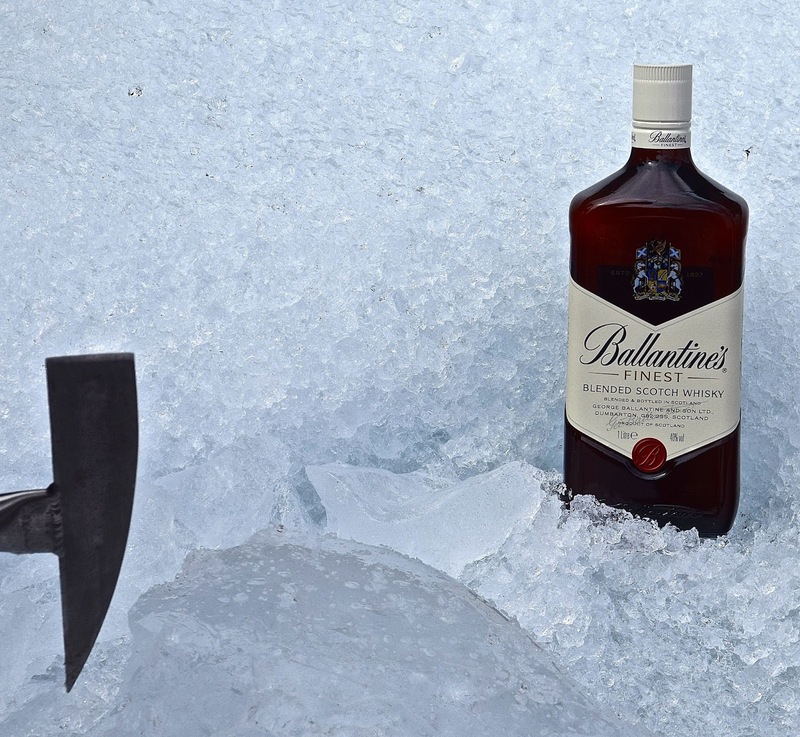 Part of the itinerary involved a Zodiac landing on Isla Santa Inés, where we could take a short hike to the base of a glacier and, on the way back, the guides fetched a floating block of ice that, with the help of a small ice ax, became whisky on the rocks when we returned to the ship. Almost as soon as I got back to the port of Punta Arenas, I boarded the Vía Australis for a three-day cruise through the fjords of western Tierra del Fuego, where slow-flowing rivers of ice such as the Brookes Glacier are a major attraction. 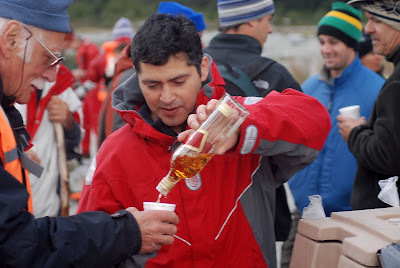 Cruceros Australis also offers whisky on the rocks but, in a twist, they also offer hot chocolate with a shot (pictured below) - the rough equivalent of Irish coffee. Southernmost Patagonia is not the only option for whisky drinkers. 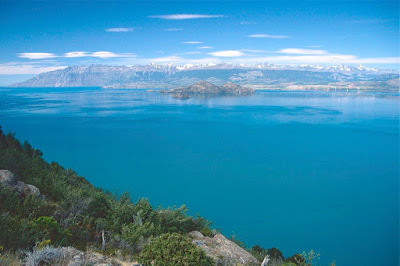 I’ve also enjoyed it in northern Chilean Patagonia’s Aisén region, on the Catamaranes del Sur day trip to the tidewater glacier at Laguna San Rafael, and on the M/N Quetru that visits the O’Higgins glacier from the town of Villa O’Higgins. The practice isn’t quite so common on the Argentine side, but I’ve had it on the trek to the Viedma Glacier (pictured below) near the town of El Chaltén. 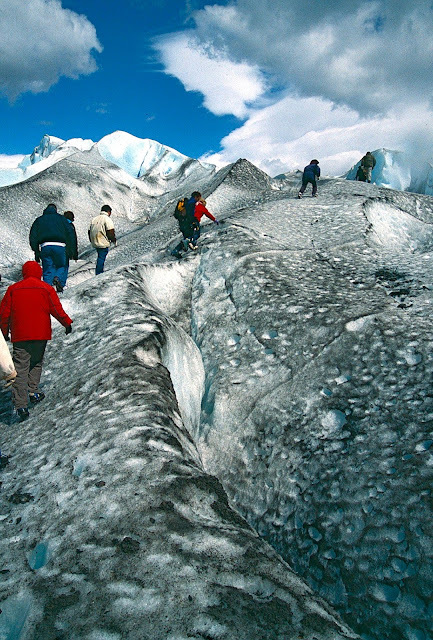 A word on language, when the topic of glacial ice comes up: Many native Spanish-speaking guides use the false cognate “millenary” to describe ancient glacial ice. In reality, this has nothing to do with women’s headwear (millenery), but rather derives from the Spanish milenario, meaning a thousand years old. This is an understandable mistake, but one that always sounds awkward to me. It’s over! On Wednesday evening, Argentina’s new finance minister Alfonso Prat-Gay announced the end of the the cepo cambiario (“currency clamp”) that, since 2011, had made it difficult for Argentines to purchase foreign currency for international travel. It also confused foreign visitors, and inadvertently created the so-called “blue dollar,” traded surreptitiously behind closed doors since 2011. The measure is long overdue, and will benefit visitors even if the weaker peso does contribute to short-term inflation (this is still unclear, since the peso has actually gained slightly against the former blue dollar since the change). Two weeks ago, on December 4th, the last place I changed US dollars for Argentine pesos was the cueva (cave) pictured above in the lakes district resort of San Carlos de Bariloche, where I had to make an appointment by phone and then be admitted through the reinforced door, where an employee in a barred booth counted out my pesos. The end of the clamp means that tourists will no longer have to seek out potentially shady money-changers in Buenos Aires or elsewhere, since they will now be able to withdraw money from ATMs without paying, in effect, a 30 percent penalty on every purchase (though they will have to pay charge on each ATM transaction; minimize this by withdrawing larger amounts). This should be a relief to everybody except the previous government of President Cristina Fernández de Kirchner, whose financial house of cards has collapsed. There remains one other major task that should make everybody's daily transactions easier. 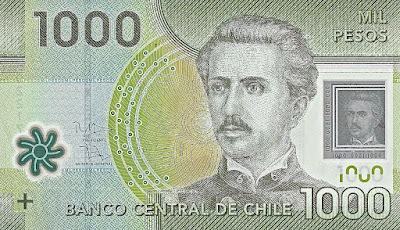 The government of newly elected President Mauricio Macri should create larger banknotes, ideally of 200 and 500 pesos, that will not test the carrying capacity of ordinary wallets and even armored cars - the reams of 100-peso notes (worth about US$7 each) are still a logistical nightmare. Recently, a young Chilean woman told me she moved to Tierra del Fuego because its clear nighttime skies offered spectacular views of the stars. It struck me, later, that there’s more than one way to interpret what she said. Divided between Argentina and Chile, Tierra del Fuego is a large but thinly populated archipelago with an international reputation but only a handful of cities and towns. For most foreign visitors on a Patagonia vacation, the prime destination is Argentina’s Beagle Channel port of Ushuaia, the gateway to Antarctica, usually reached by air or cruise ship. 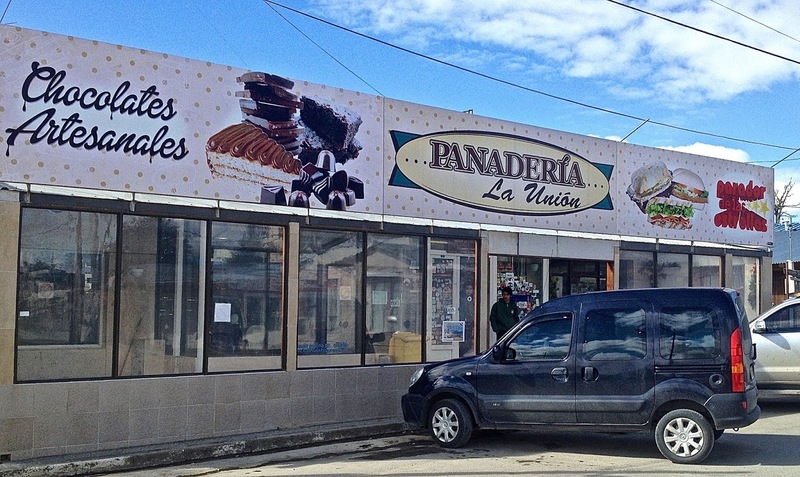 For overland travelers, though, the tiny town of Tolhuin, where the land begins to rise midway between the industrial flatlands city of Río Grande and Ushuaia’s scenic sierras, the bakery known as Panadería La Unión has become an obligatory stopover. 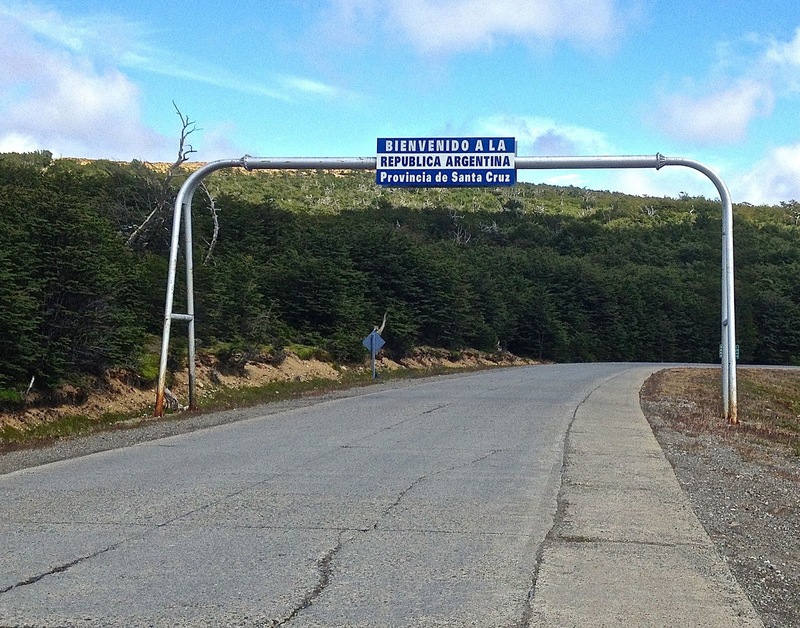 In fact, all the buses that travel between Ushuaia and the Chilean city of Punta Arenas, on the South American mainland, stop here so that passengers can load up on medialunas (Argentina’s version of the French croissant) and other pastries, plus empanadas and chocolates for a 12-hour trip that involves a ferry crossing over the Strait of Magellan (there are no longer any flights between Ushuaia and Punta Arenas). So does almost every Argentine motorist en route to “the uttermost part of the earth” (to appropriate the title of pioneer Lucas Bridges’s memoir of his life on the island). 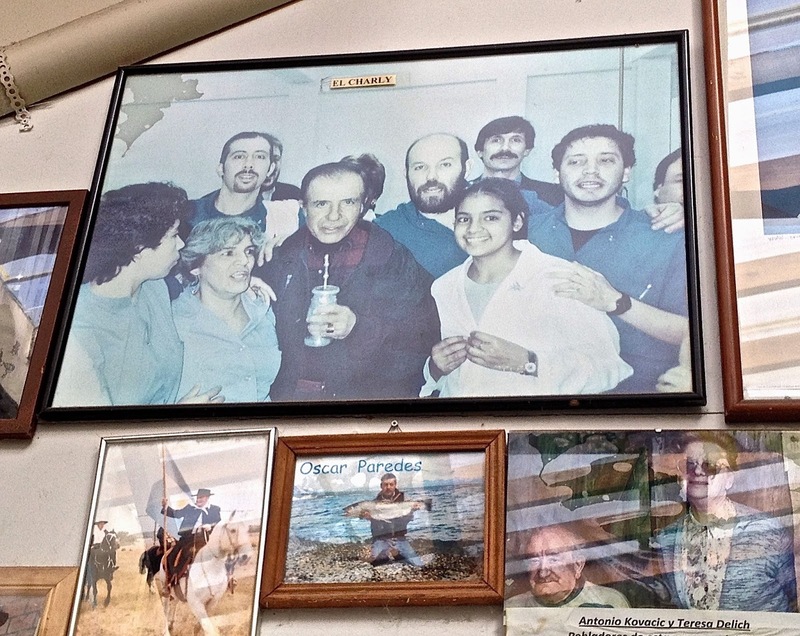 Many of them stop in hopes of glimpsing the Argentine and even foreign celebrities whose photographs cover the walls. 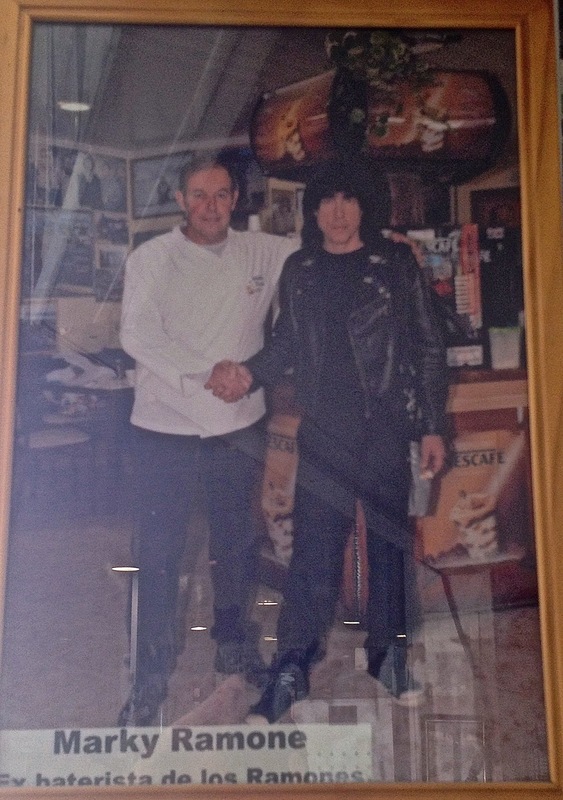 Among them are the (now disgraced) President Carlos Menem (pictured above), the Dylanesque folk-rock singer León Greco (pictured below at left; his signature album “De Ushuaia a La Quiaca” spanned the length of the country) and even the US rock drummer Marky Ramone (pictured at bottom; the Ramones were enormously popular in Argentina). 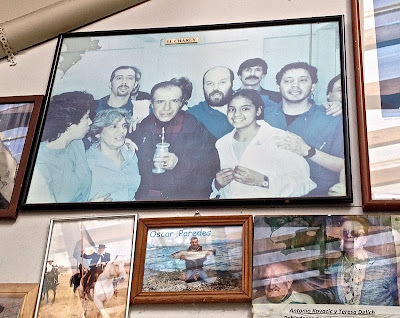 In a town that takes its name from an indigenous word meaning the “heart” of the island, there’s also a tribute to the late Buenos Aires surgeon René Favaloro, who pioneered coronary bypass surgery while working in the United States. 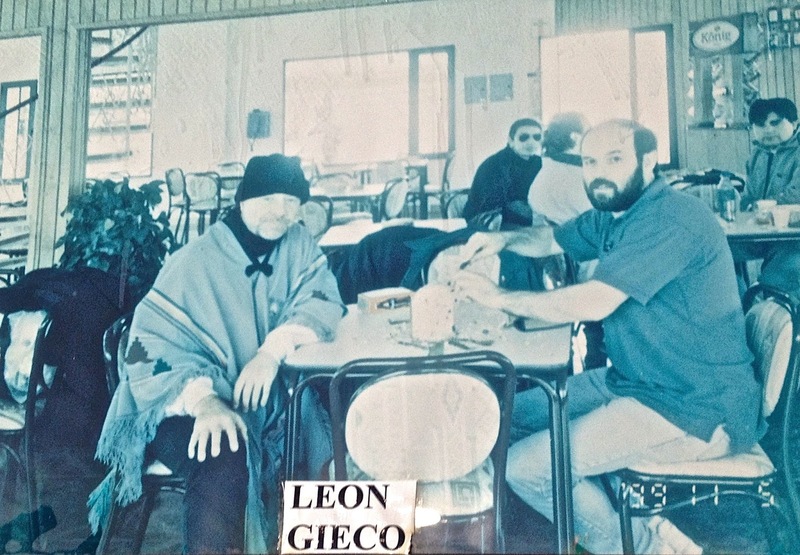 However quintessentially Argentine La Unión may be, it has one surprising shortcoming. In a country where almost every remote town offers fresh espresso on the spot, the “bakery to the stars” offers only a coin-operated vending machine to purchase coffee. Early last year, while driving Chile’s Carretera Austral, I photographed this bumper sticker – plastered onto the back side of a highway sign – denigrating environmental philanthropist Douglas Tompkins in hopes that he would get out of Patagonia, where he helped create new protected areas in Argentina as well. While small, strong opposition to Tompkins came from local and even national government officials, and even some paranoid nationalists who even imagined that he was a Zionist. I met Tompkins a few times, but never really got to sit down and talk with him, though I did have an extensive interview several years ago with Kris Tompkins about Parque Patagonia and their other properties. 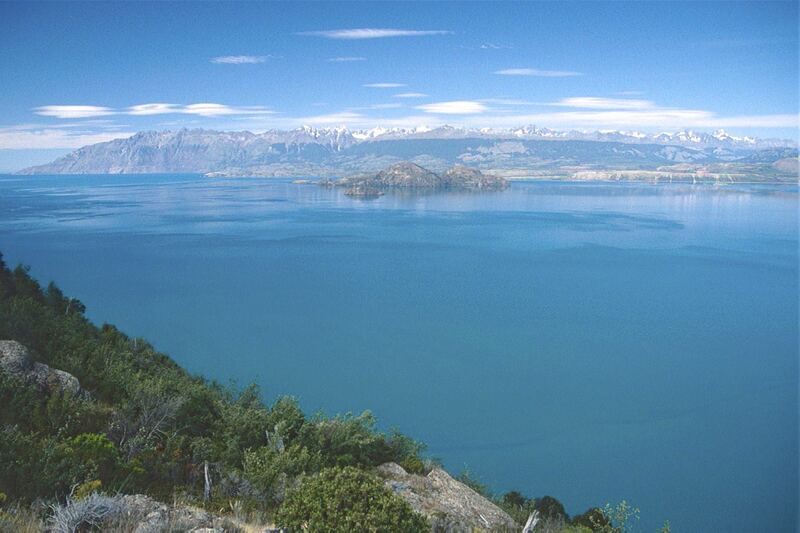 Given their legacy with Parque Pumalín and similar projects, there may never be the “Patagonia without Tompkins” that his detractors hoped for. On Tuesday, before hearing of Tompkins’s death, I paid a brief visit to Argentina’s Parque Nacional Monte León, on the Atlantic Coast of Santa Cruz province. 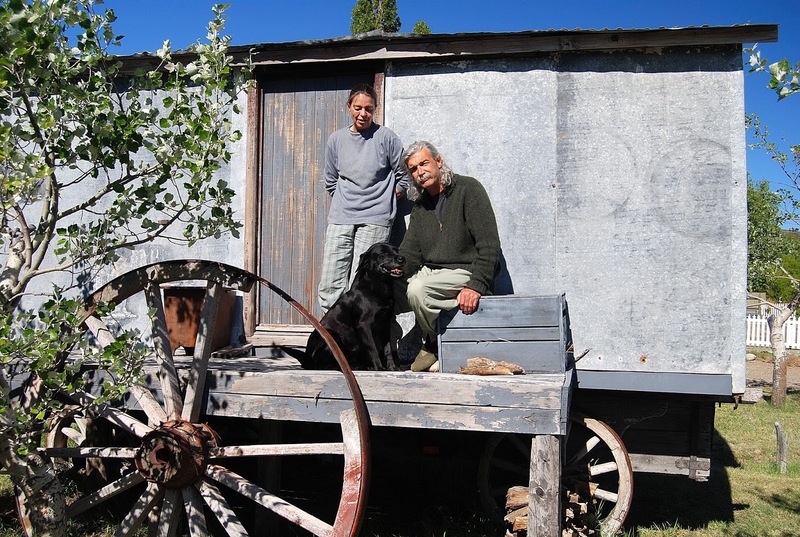 This was another Tompkins/McDivitt project, created by purchasing the Estancia Monte León sheep farm from its owner Silvia Braun (pictured below with her husband, Juan Kuriger). Silvia belonged to the Braun-Menéndez wool-growing dynasty but, in my contacts with her, she was something of a free spirit. While donating the park to the Argentine government, the Tompkinses retained a small section that includes the former big house as what is now Hostería Monte León. 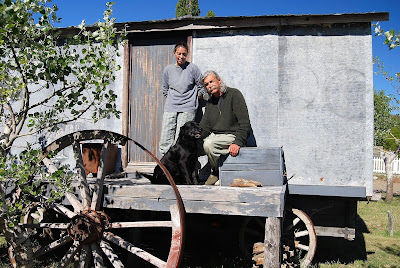 There, Silvia was contented to tend her organic garden as a Tompkins employee, so long as it let her remain in a place she loved – living in the simple trailer pictured here.